The current parcel of land known as Cedar Galleries was previously part of a much larger holding on which the Ten Chain Sawmill operated. The sawmill gives its name to Ten Chain Road, the Old Ten Chain Road and Sawmill Road in the close vicinity. The mill operated commercially for decades, and the most recent sawmill shed which still stands today was built in the 1950s. The concrete footings of the old steam engine, complete with the huge bolts that held it firm are still visible today. The only other building still onsite from that time is the sawmill manager's residence. The artist village was originally established in 1997. 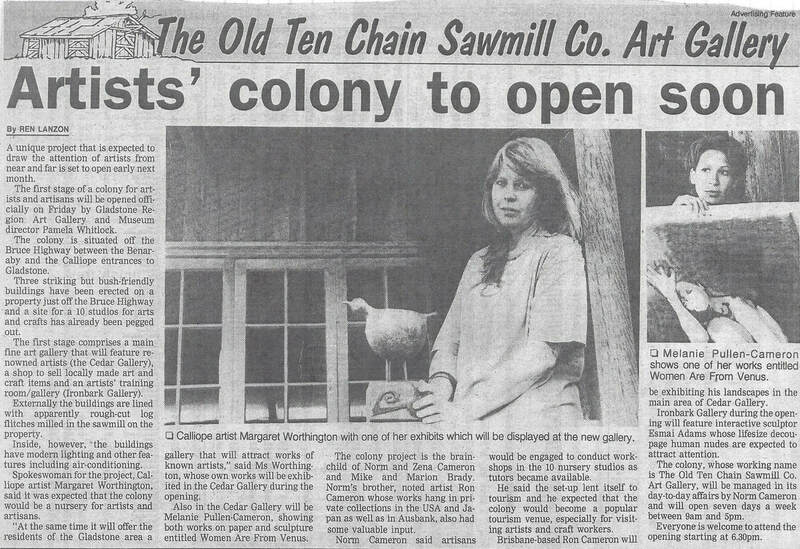 It was the vision of artist Norm Cameron who purchased the current parcel of land towards the end of the sawmill's operations. Norm personally built around 90% of the artist's village with the village growing organically to accommodate new artisans. The buildings were crafted from wood cut on-site, mostly being the off-cuts from the many decades that the property operated as the Ten Chain Sawmill. The bush chapel was built in 1998 for Norm and Zena's daughter Melanie's wedding. It has since been the site of hundreds of marriages of local couples and holds a sentimental place in many hearts. In 2010 a mother-daughter team, Sandy and Angela, decided it was time for a tree change and brought their expanding herd of alpacas north from outside Brisbane. The village had grown quiet, so they injected new enthusiasm and ideas, and renovated the gorgeous Australiana buildings giving many new purposes. They established the Gladstone region's first Farmers Markets operating weekly and bringing families out for great local produce and hearty breakfasts. They brought new regular art groups to the studios of the village and introduced the word "alpaca" to the vocabulary of Gladstone kids.